Ideally situated in the 'Medina' area, only a 10 minute walk to the main sandy beach and the kitesurf/windsurf lagoon. This modern two bedroom apartment with a large balcony is located on the 2nd floor. 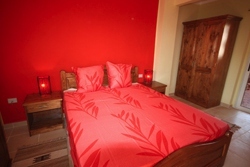 Totally renovated in 2014, Seenaï will sleep 4 people very comfortably. It has two bedrooms, a nice living room with an open plan kitchen, a great 18m2 outdoor balcony-terrace, a bathroom and separate toilet. A fifth person can sleep on the comfy sofa in the living room. 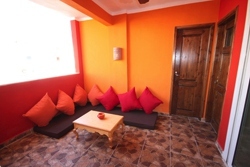 Wifi & quiet modern air conditioning in all rooms. 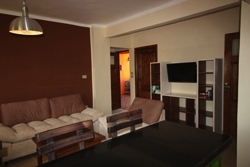 Living room with big comfy two and three seater sofas (200cm long ideal for a fifth person). Satellite TV. 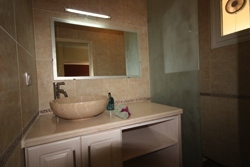 Bathroom with shower and plenty of water pressure. 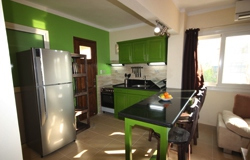 Kitchen: Fully equipped kitchen with fridge/freezer, toaster, kettle, cooking utensils, four hobs gas stove and oven plus espresso coffee machine. 18m2 balcony with a bedouin corner, low table, little shower to rinse the sand off your feet/ wetsuit or harness. Direct access from the balcony to both bedrooms. Little balcony facing south, great for your morning tea or coffee. It is allowed to smoke on the terrace while enjoying the view over the Sinaï Mountains. A small supermarket and a local cafe are just a short walk away.